Can a machine-tool acquisition change the way a 50-yr.-old equipment manufacturer approaches metal fabrication? When it’s a fiber-laser system that reduces processing time by more than 90 percent, and cuts with air-assist gas at a fraction of the cost of nitrogen, the answer is clear. Doyle Equipment manufactures a complete line of dry bulk material handling-equipment for the fertilizer industry, including blenders and spreaders. Shown is a 2-ton spreader. 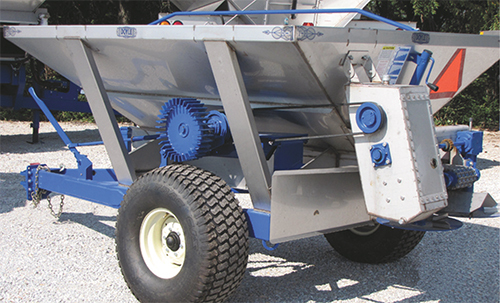 According to the Doyle website, spreader hoppers are constructed of laser-cut 14-gauge Type 304 stainless steel, with seams continuously welded inside and out. The gear case also is of laser-cut 304 stainless. The frame assembly is of heavy-duty mild-steel tubing and laser-cut corner braces. And, the twin 191⁄4-in. spinner dishes also are fabricated from heavy-duty mild steel, with each dish including three laser-cut blade-location holes. “Our new fiber laser is a game-changer,” says Stuart Rumple, production manager at Doyle Equipment Manufacturing, Quincy, IL. The firm manufactures dry bulk material-handling equipment for a worldwide customer base in the fertilizer industry. Doyle’s new fiber laser, a model CL-940 from Cincinnati Inc., Cincinnati, OH, replaced two aging CO2-laser cutting machines—1500- and 3000-W models. And, immediately reduced processing time when cutting components for Doyle’s equipment—from 64 hr. down to 4 hr. The CL-940 also has reduced operating costs and helped the company stay current on manufacturing techniques that lead to higher productivity. Doyle Equipment Manufacturing, which also runs a second manufacturing operation in Palmyra, MO, employs 150 people in the manufacture of conveying, blending, tending and spreading equipment. It fabricates more than 11,000 parts, with annual order quantities ranging from a few to more than 10,000 pieces. More than 90 percent of all Doyle parts, primarily of stainless steel, are processed via laser-cutting machines, so highly productive cutting is a key to the company’s cost-efficient operations. Rumple and the team at Doyle first witnessed the ability to laser-cut with air assist on a fiber laser during a training session at Cincinnati Inc. Using its existing shop air at 100 psi, Doyle added filtration with a refrigerated dryer that feeds a high-pressure booster (450 psi maximum) to a high-pressure receiver, filters and a refrigerated dryer. The setup ultimately supplies regulated clean, dry air at 350 psi to the cutting machine. 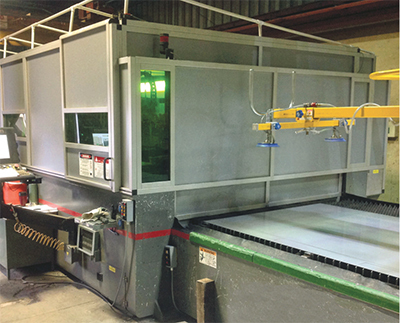 Doyle’s new fiber laser, a model CL-940 from Cincinnati Inc., replaced two aging CO2-laser cutting machines. It uses high-pressure air assist to cut all of its 18-gauge through ¼-in. Type 304 stainless steel, as well as 14- to 10-gauge mild steel. Doyle now uses high-pressure air assist to cut all of its 18-gauge through 1⁄4-in. Type 304 stainless steel, as well as 14- to 10-gauge mild steel. The fiber laser also gets limited use cutting 1⁄4-in. mild-steel sheet with oxygen assist, used to fabricate fixtures. “Ninety-five percent of our fiber-laser cutting is stainless steel using shop air,” adds Rumple. In addition to higher productivity, Doyle’s new cutting machine also is saving money due to the lower cost of air compared to nitrogen. According to Rumple, a nitrogen system requires a 50-hp compressor to generate the required pressures, but air assist only requires a 15-hp compressor. Article contributed by Cincinnati Inc., Cincinnati, OH; 513/367-7100, www.e-ci.com. Nice post. I learn something more difficult on various sites daily. It will always be exciting to learn information from other authors and training something from their store.